Once again, the universe is answering my plea and providing me with quality chocolate when I was beginning to think I could find nothing new where I live. 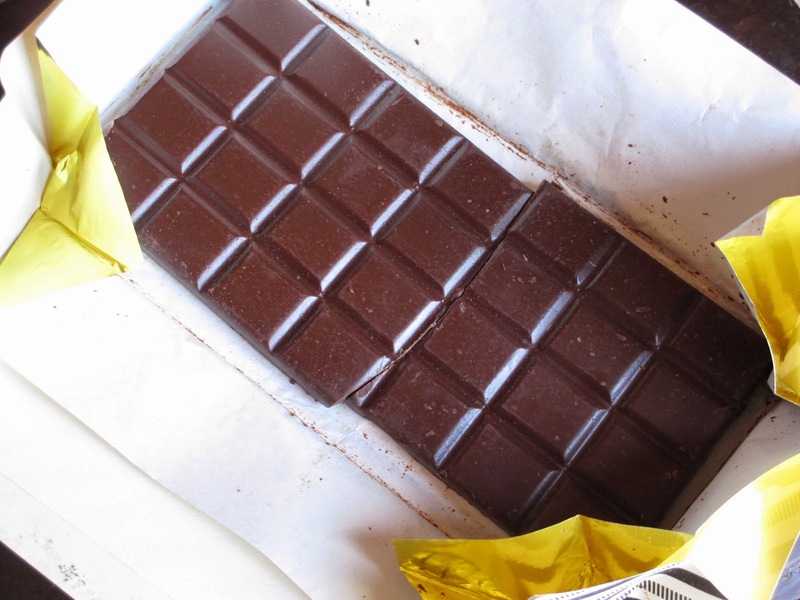 This time I was at Sur la Table, which I've known to carry chocolate more for cooking with than for eating straight. They usually have some Valrhona, Guittard, things like that. This time, however, there were also a few bars by the register. And guess what I found there? 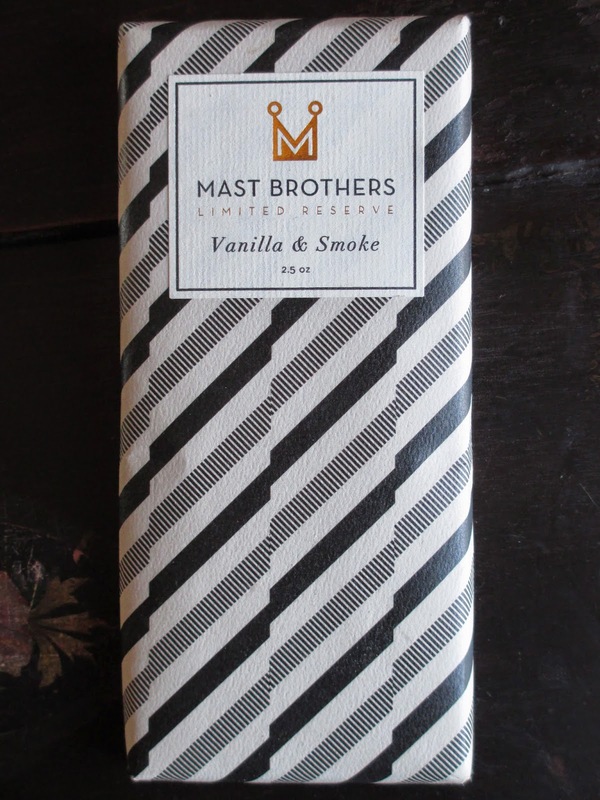 The Mast Brothers. You know what this bar, on the outside, is? It's beauty. 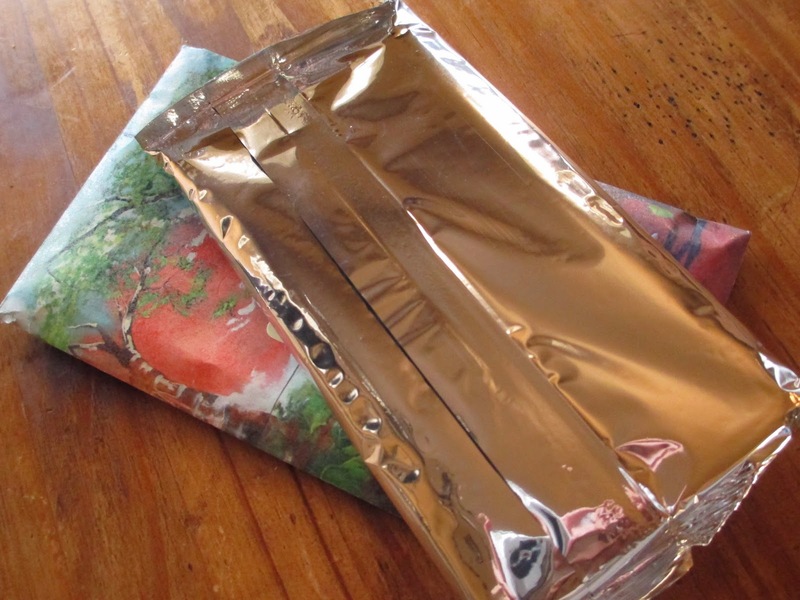 Thick paper, decorated in black and white, enfolds the gold foil-wrapped chocolate. The look is simple, catchy, handmade, and artisan all at once. 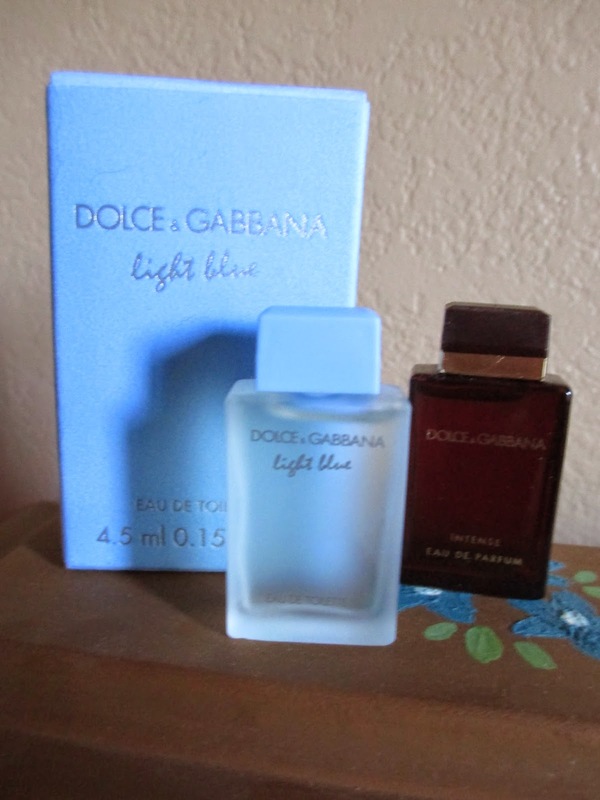 You feel special buying it for yourself and very thoughtful giving it as a gift. On the inside, the bar is standard. No markings grace the smooth faces of the 28 small squares. It is, by the way, a 2.5 oz bar that was priced originally at $11.95 but that I got on sale for $5.99. 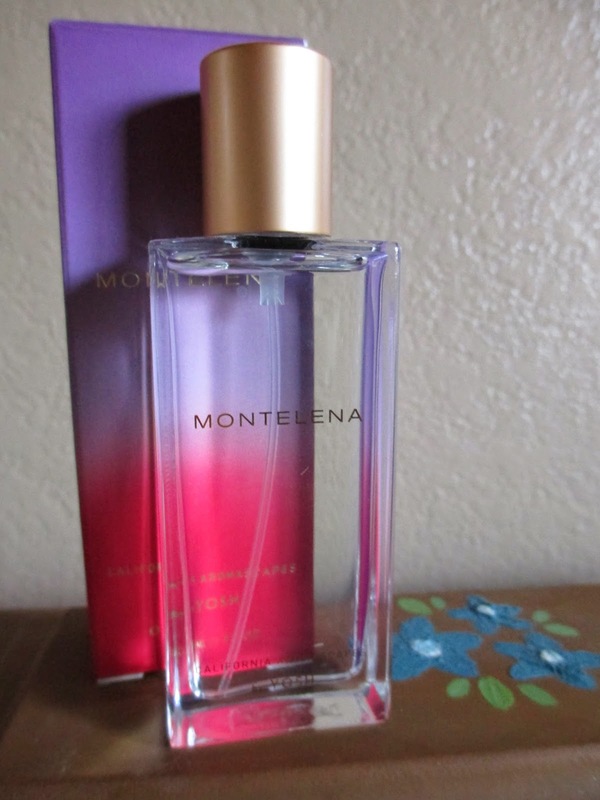 Pricey, but not the absolute highest price I've come across. 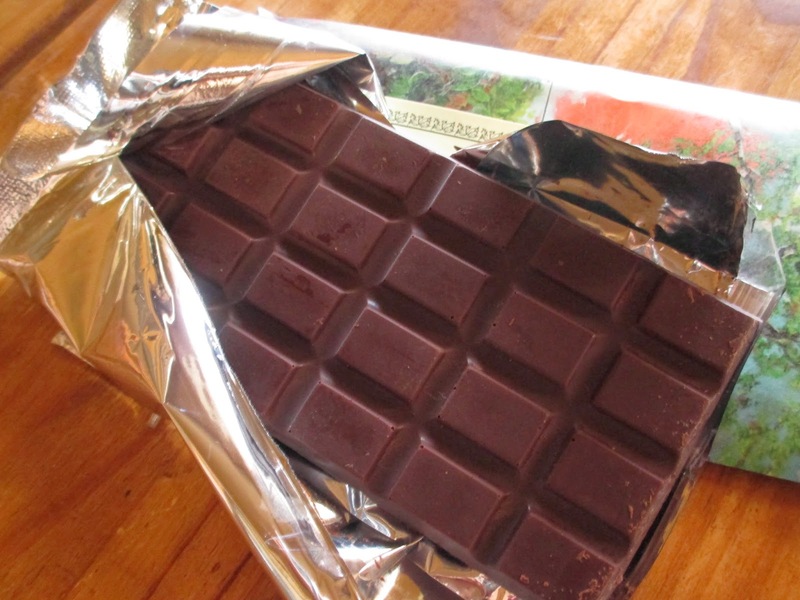 When encountering an infamous chocolate company, one would like to try first a plain bar. But there were only three flavored selections available, so I tried to get the least flavored of them. That turned out to be the Dark Chocolate Vanilla & Smoke, which contains only cacao, cane sugar, and vanilla bean. 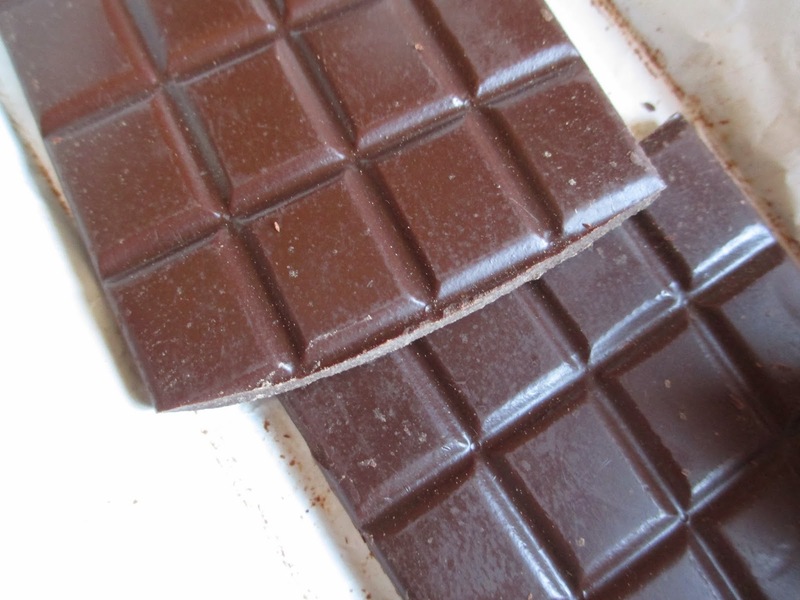 Most chocolate has vanilla, so you could almost look at this as a plain bar, anyway. 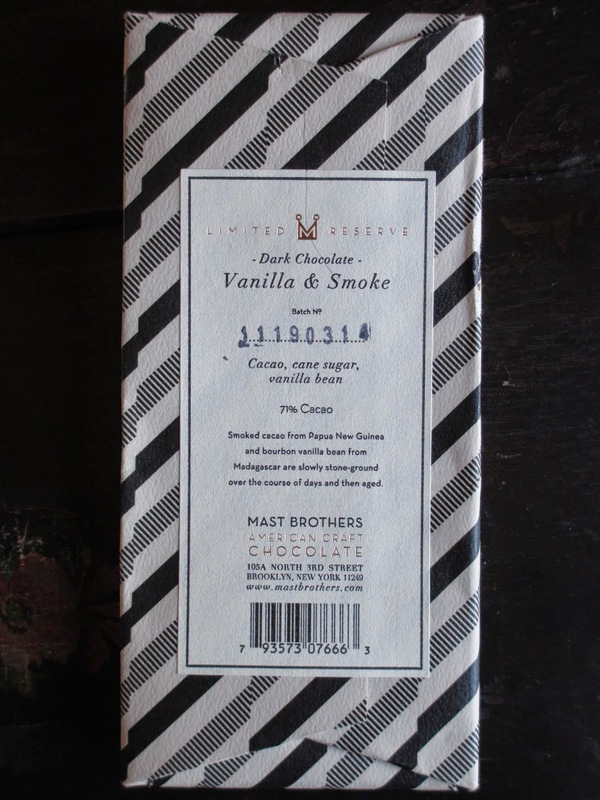 The description runs thus: "Smoked cacao from Papua New Guinea and bourbon vanilla bean from Madagascar are slowly stone-ground over the course of days and then aged." It's a 71% cacao. On tasting, there is a definite smokiness. It's combined with that light bitter tinge of the dark chocolate, but it quickly becomes accompanied by the sugary vanilla flavor. Then the chocolate notes come in to coax the bitter and sweet elements back together into a warm and rich embrace. Ever so slightly dusty mouthfeel towards the finish. It's what I would call a silvery taste, putting in mind Guittard's Quevedo Bittersweet bar. Then comes the best part. Once the chocolate is gone, you're left with a brownie taste, intensely warm and red and rich. At first bite, I wasn't quite sure how thrilled I was--once I'd gone through the whole tasting, however, I was converted. This is a lovely bar of chocolate. The flavors feel fresh and good quality, and there is just the right amount of whimsy and sweetness added against a darker, smoky background. I like being alone with this chocolate. It figures: she has always loved jewelry and makeup, that sort of thing. She's such a girly girl--but with that right touch of toughness. So I thought, what's the first step she can take toward her goal? Why not give her a portrait? (Okay, that isn't why I painted her. It's actually become a custom of mine to paint pets. I've done six or seven already.) 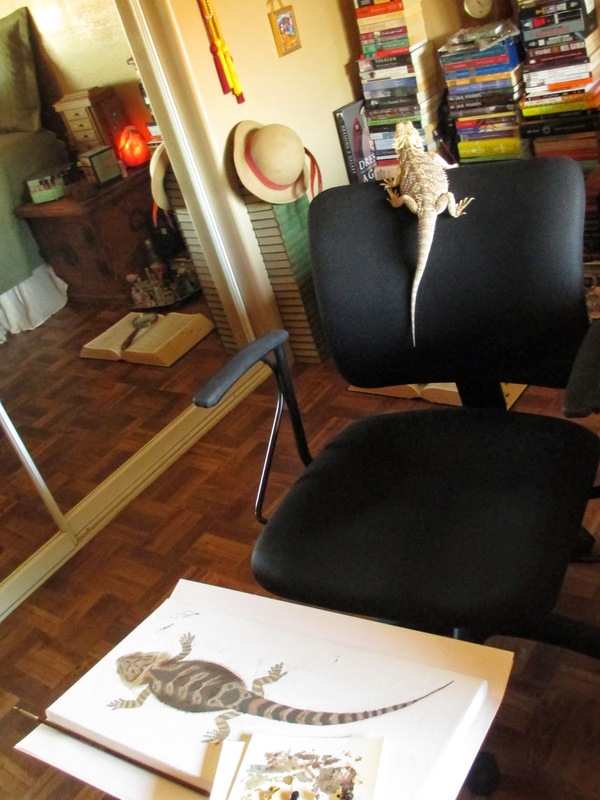 Did you know how difficult it is to try and paint scales? I'm used to painting fur, which mimics brushstrokes. 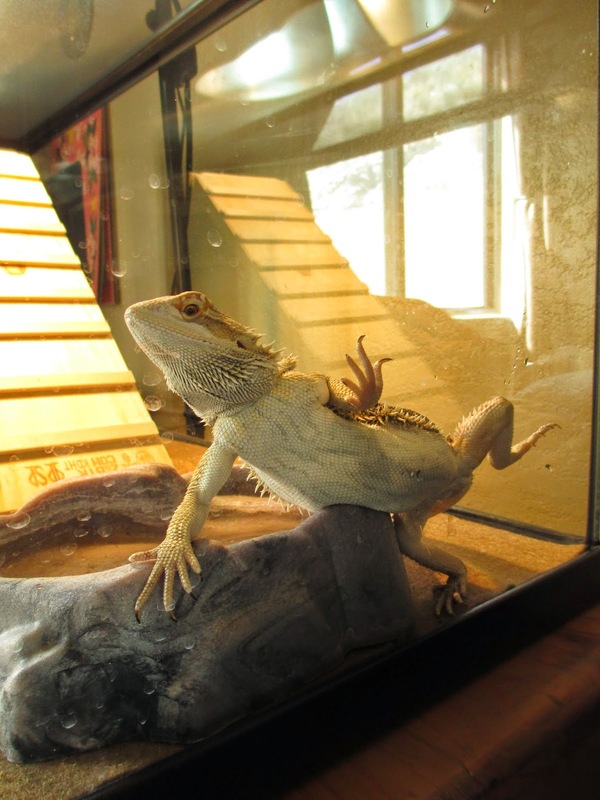 But scales are completely different. I was at my wit's end, painting in layer after layer while watching Star Wars behind the scenes. Sylvia came in to investigate my progress and make a few helpful suggestions. She's such a sweet little dragon. I usually have a bit of an issue with Oscar Wilde--and with the aesthetes in general. I can't feel that aesthetics are all there is to beauty and therefore to art. Art involves aesthetics, certainly, but I can never place as much value on aesthetics as Oscar Wilde and others do. I consider art expression as well as beauty--and the expression itself can be beautiful, apart from straight aesthetics. But then we run into another question: whose expression? Is it personal expression, as in the expression of the artist? Does that mean expression as direct from the artist's perspective or not? Is it expression of the character/speaker/etc? Is it expression of a culture? How much separation is there, after all, between the artist and the speaker and between the artist and the culture? It's a web of lines, intertwining back and forth, and that perhaps is why people have such differing explanations of what art is. Art is vision given physical form. Physical form can, of course, also mean words: it's the distinction between things within and outside the mind. Aesthetics, on their own, have no vision. The shape of a circle is aesthetically pleasing, but without vision it is nothing. The small metal mirror hanging on the wall in front of me is beautiful not just because it is a circle; it is beautiful because it is handmade, shaped into perfection and punched with a pattern of small dots and delicate edging; it is beautiful because of the hands that made it. That's why not everyone agrees about what is beautiful: beauty is more than aesthetics. And if art were simply aesthetics, artists would have run out of creation long ago. I see beauty when I look outside, at the shades of brown and white and yellow and green that stretch toward the mountains of blue that look up toward the broad and bold sky. Someone else sees beauty in the curved metal of their car. We can both see that the other has a valid concept of beauty, even if we don't see things in the same way. And that is where the expression side of art comes in. Art is aesthetics with the personal perspective added in. Art isn't just the artist speaking to you directly out of their thoughts. But it is shaped by how the artist sees the world. 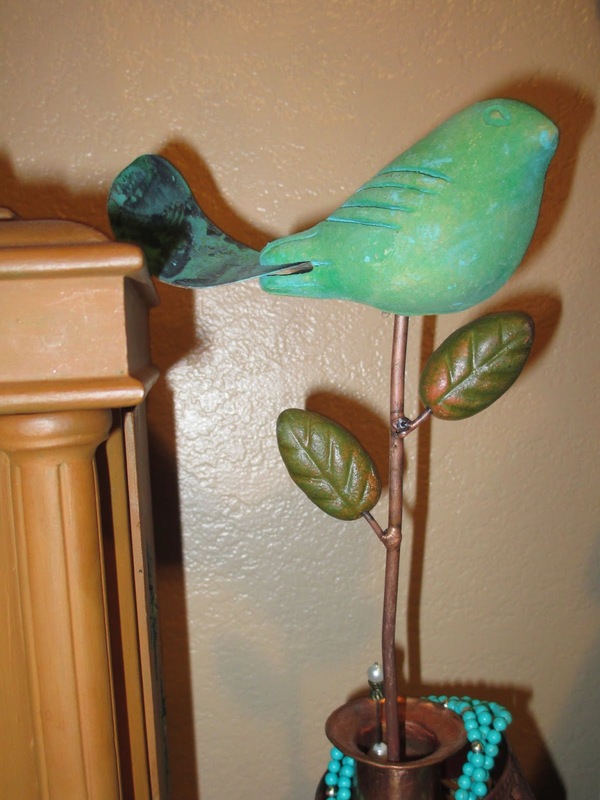 I am of the land and any art that I create, in some way, expresses that identity. Some artists love simplicity and clean lines, and viewers who love the same will connect with their art and enjoy it. That's what it's about: the artist connects with the art he creates, and then the viewer connects with the art the artist has made. It's about connection . . . so then art is language. Language is a collection of forms and rules but only receives life from the mind that controls and forms it. The Phoenix Art Museum has been running a Hollywood Costumes exhibit, which I visited a couple weeks ago. There is quite a range there: Indiana Jones, Sweeney Todd, Queen Elizabeth I, Darth Vader, various Hitchcock heroines, a motion capture outfit (surely I wasn't the only one who noticed that Andy Serkis's quote was mislabeled as coming from Randy Serkis? That was terrible), and Dorothy's dress and slippers, among many more. So there were many movie books and such available for purchase, including many Wizard of Oz items. I wished I were 15 or so years younger so that I could get the toy basket with a Toto doll inside. Instead I ended up with the autobiography of the dog who played Toto; that's almost as good, anyway, isn't it? Willard Carroll put together this book; he describes in his introduction how he found the text in an old metal box on the site where Toto lived, trained, and was buried. 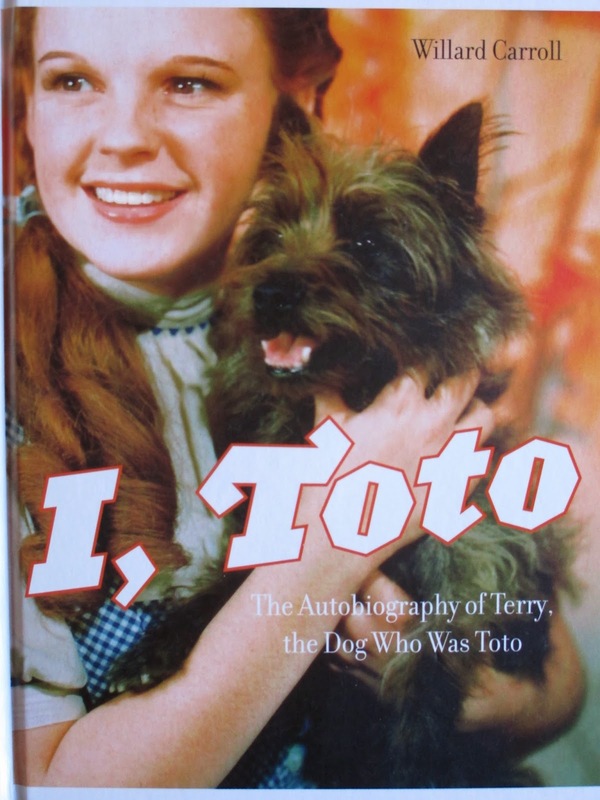 Toto was originally known as Terry, and yes, she was a girl. Her owners were frustrated by her because she had accidents in the house, so they left her with Carl Spitz the dog trainer. Many of his dogs worked in movies, and he had no trouble training Terry until she, too, was ready for the acting business. She worked first with Shirley Temple, later on The Wizard of Oz, and on various other films over a course of years. This book, at just under a hundred pages, is short. It's also sweet. To accompany the text, there are also old photographs of Terry with the other dogs she lived with and the actors she worked with. A few newspaper clippings, illustrations, and reviews accompany the pictures. From a learning standpoint, this book offers a look into an area that is much-less explored, though it is within another area (The Wizard of Oz in general) that receives much attention. This book answers the question of who Toto was and also of what it was like for a dog to enter the acting business. The old-fashioned voice and style are quaint and simple, making you quite adore the dog who became Toto.